The digital sketchpad integration isn’t good enough to justify giving up a keyboard. At a time when Apple, Microsoft and Google are pairing their new tablets with keyboards, Lenovo has done the unthinkable. It's completely ditched a true keyboard for a digital sketchpad, trading snappiness, travel and actuation for a smooth, futuristic touch surface. The idea is to offer a note-taking experience that's so effective you'd feel comfortable leaving the keyboard behind. The Lenovo Yoga Book, available in Android ($500) and Windows ($550) versions, is inventive. But Lenovo claims that the Yoga Book is the "ultimate tablet for productivity and creativity," and that's where the company is wrong. Despite plenty of well-intended enhancements, such as multi-window support in the Android model, Lenovo still failed to make device that truly facilitates productivity. The Lenovo Yoga Book, available with either Android or Windows, is a compelling hybrid device -- at least on paper. It ditches a physical keyboard for a touch-sensitive surface that does double duty as a keyboard and digital sketchpad. With the included stylus, you can draw on the deck, even when the tablet is asleep, and your notes will still be saved. You can even write on real paper and convert your scribblings to digital. Still, none of these writing features make up for the terrible typing experience. Although it scores points for novelty, the Yoga Book is too unreliable to be a true productivity machine. Be the first to review the Yoga Book? The Yoga Book is available with either Android or Windows, and the only differences on the hardware front are their color options (the Windows version is only available in black) and the detailing around the trackpad. Either way, both flavors are gorgeous in an understated, elegant sort of way. The design combines a subtle matte finish and clean lines, with a touch of sparkle along the hinge. The best part is how thin and light the magnesium alloy frame is, at 0.38 inches thick and 1.5 pounds. Though it should be easy to take to meetings, as a tablet the Yoga Book feels heavy. You'll need two hands to pry open the device, because it's magnetically sealed -- and there isn't an indentation in the edge where you can stick your finger as you're lifting the lid. Once you get it open, the first thing you'll notice is how smooth and flat the keyboard area is. That emptiness can be a little startling at first, but you'll get used to it soon enough. Whether you'll get used to the way it feels, though, is another matter entirely. Like Lenovo's previous Yoga convertibles, the Book has a sturdy 360-degree hinge that lets you set it up in four different "modes." Flip the screen all the way around to use it as a tablet, prop it up with the screen facing you for a makeshift TV or spread the two sides completely flat if you want a surface to draw on. You can also use the Yoga Book as a traditional clamshell laptop, but because there isn't a keyboard to anchor it, the device sometimes topples over if you jab at the screen too hard. Speaking of, the Yoga Book's 10.1-inch full HD IPS display is plenty bright, and was easy to see even in direct sunlight. However, its glossy finish means if you're watching something with dark sets, such as The Dark Knight or Stranger Things, you'll see quite a bit of glare. The Book comes with what Lenovo calls a "Real Pen," which is thicker and more comfortable to hold than Samsung's S Pen or the Apple Pencil. It even comes with a cap that doubles as a tool for changing out the stylus filament. I just wish Lenovo had been able to squeeze in an onboard dock for the stylus, but the Yoga Book is barely thick enough to house a pen on board. But let's get to the feature that sets the Yoga Book apart: the disappearing touch keyboard. Lenovo calls it the Halo Keyboard, presumably after the rings of light that surround each key region. Instead of physical buttons that you can push down, you'll see outlines of them on the smooth, touch-sensitive surface. These virtual buttons are large and evenly spaced, and you don't have to hit them hard to make your keystrokes register. Managing to type quickly and accurately, though, is quite difficult. It's a lot to get used to. Lenovo, for its part, claims that two hours is enough to become familiar with the setup here. Those who type with just two fingers will probably have an easier time surmounting the learning curve, but touch typists like myself might never get acclimated. For us, resting your fingers on the F and J keys during a typing pause is second nature, but in this case, that would trigger those letters on the Halo deck. That means if you're going to use the Yoga Book, you'd better be prepared to unlearn old habits. Still, Lenovo at least tried to make the experience efficient. It added adjustable haptic feedback and backlighting to help the Halo setup mimic a real keyboard, as well as predictive text and autocorrect for accuracy. While the Windows version relies on Microsoft's onscreen keyboard, the Android flavor uses third-party TouchPal software, whose autocomplete suggestions I found intrusive. Any momentum I had built up was frequently interrupted when I had to hit the return key twice to break to a new line, since the first key press only served to confirm that I wanted to use the first suggested word. I was, however, pleased to find that common shortcuts such as Alt-Tab, Ctrl-Del and Ctrl-F were supported. My typing eventually got pretty accurate, but never very fast. The onscreen keyboard provided little relief. Not in the Android version, at least. Its large buttons showed both letters and special characters, like ampersands and percent symbols. Seeing those special characters didn't make them easier to access, and their presence only really served to clutter up the interface. It was distracting and a little confusing. You can switch back to Google's default option, but even so: I wish Lenovo had handled this better. Fortunately, at least, this wasn't an issue on the Windows version. Another thing that bugged me about the Halo keyboard was the trackpad below it, which is small, sluggish and jumpy. Taps sometimes registered clicks, but other times nothing happened. This occurred across both OSes, but it was more pronounced on the Windows device. Other than using the touch display, there really isn't a great way to interact with the Yoga Book. Still, doing away with a real keyboard is sometimes worth it, if only because of the cool sketchpad integration. The Halo panel turns into what Lenovo calls the Create Pad when you press the pen button on the top right of the deck. You can use the included stylus to draw on this; it's like having a Wacom digitizer attached to its own screen. What's more impressive is that you can write on the Pad even when the tablet is asleep. Press and hold the pen button until it vibrates and you can write on the plain black sketchpad. Your scribbles will be saved to Lenovo's note-taking app. That's interesting, but not all that useful since you can't see what you're writing. Separately, there's a feature that lets you write with real pen and paper and have that all simultaneously show up on the Yoga Book. This is perhaps the feature that traditionalists will love most. Using the pen's included cap, you can swap out the stylus for an ink cartridge and use it as an actual pen. Place any notepad on the keyboard and start writing, and it'll show up on the screen. This, too, works while the tablet is asleep. All of these features work as promised. And yet, as close as that last one gets to matching a real pen-and-paper experience, I still felt limited by the physical boundaries of the writing surface. In a note-taking session where I needed to be fast, I found it easier to just write on paper, which stayed put and on which I could write horizontally, vertically and in corners. On the Yoga Book, I had to pause and make sure the pen was hovering at the right spot before I could continue scribbling. Most of the notes I took ended up not making much sense. Ultimately, the sketchpad is useful for drawing and writing short phrases; not so much for extended note-taking sessions. 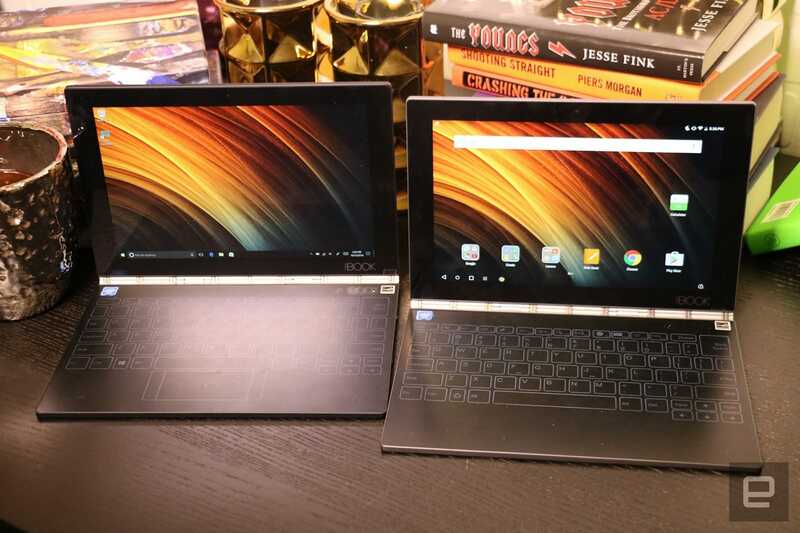 Other than the note-taking and drawing implementations, both editions of the Yoga Book run pretty standard versions of their respective operating systems. Windows 10, in particular, is a better option for those who want multitasking tools and support for desktop apps. Despite Lenovo's efforts to integrate multi-window apps in the Android Marshmallow version, the feature only works for select programs, such as Gmail, YouTube and File Manager. Not many third-party apps can do this at launch, and you can only open up to three apps side by side anyway. When Lenovo updates the device with Android Nougat (it's unclear when that will be), multi-window will be a native feature that works with all apps. One feature I really like is the camera's Smart Capture mode, which lets you shoot pictures of important info, such as lecture slides, and converts it into a flat, PDF-like image. I tried this out at a recent product briefing, taking shots of presentation pages from an odd angle. The app quickly and accurately detected the sides of the projected screen, highlighted them in green, straightened the image and then zoomed in on the highlighted area. Initially, I wasn't wild about the camera placement. It's on the Halo keyboard deck next to the pen button, which means it faces up when you're using the Yoga Book as a laptop. But use it as a tablet and it's well-placed as a rear camera. As you'd expect, the front camera sits above the display, ready for selfies. 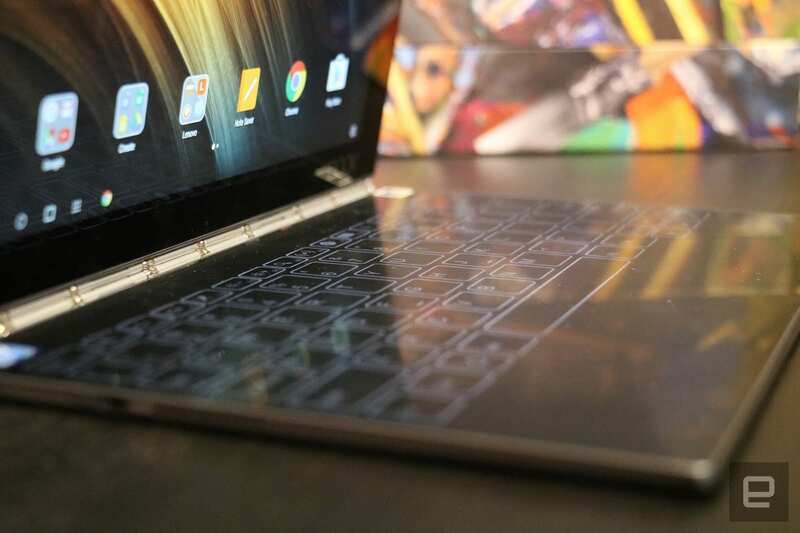 Thanks to its 1.4GHz quad-core Intel Atom x5-z8550 processor, 4GB of RAM and 64GB of storage (expandable via the microSD card slot), the Yoga Book was generally zippy and multitasked well. Switching between Note Saver, Camera and Google Docs was easy, and I could quickly snap pictures of presentation slides, even while Drive, Play Store, Gallery and those other apps I mentioned were open. I didn't encounter any delay when swiping through pages of apps, and zooming in on web pages felt smooth. There was some lag in launching apps such as Camera and Amazon's Kindle, though. * SunSpider: Lower scores are better. Benchmarks tell largely the same story. The Android Yoga Book trailed the Pixel C and the iPad Pro in Sunspider, while its Vellamo score was half that of the Pixel. Its performance on graphics tests 3DMark Ice Storm Unlimited and GFX Bench were similarly lackluster. The Windows version kept pace in PCMark 7 with last year's Surface 3, which uses an older quad-core Atom CPU. With its large 8,500mAh battery, the Yoga Book took two days of light to moderate use to get down to a 10 percent charge. That's in line with Lenovo's maximum-battery-life claim of 15 hours. The Android version lasted 11 hours and nine minutes on Engadget's standard battery test, which involves looping an HD video at 50 percent brightness. We tested the Windows version at 65 percent brightness, and it clocked eight hours and six minutes. The Pixel C and the Surface 3 both fell a few hours short of the Android's runtime. You'll want to make sure to use the included adapter when recharging, because that big battery will take a while to re-juice. Lenovo said the device will get fully charged in about three hours with the supplied cable. There really isn't anything quite like the Yoga Book. 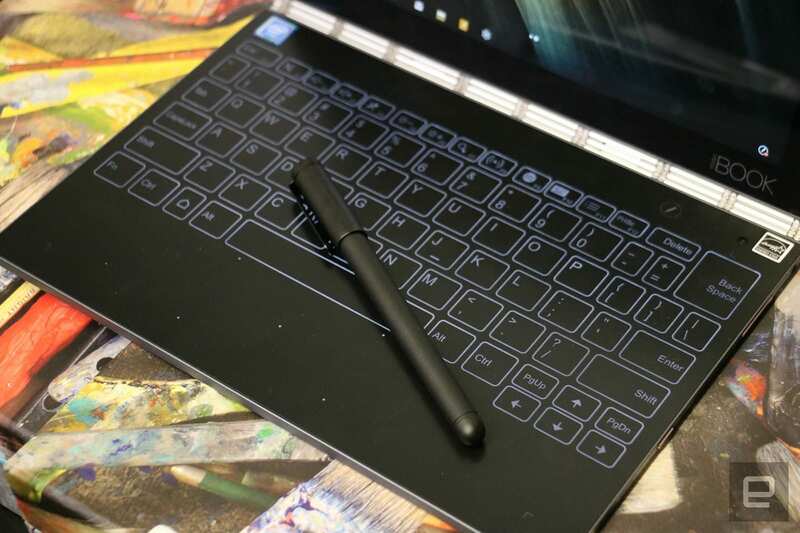 Even though the Surface Pro 4 also takes in pen input and is often marketed with a keyboard that you have to buy separately, it also uses a laptop-grade processor that's much more robust than the one inside the Yoga Book. The Android model faces off against Google's Pixel C, which also starts at $499. While the Pixel is much more powerful than the Yoga, it, too, suffers from some input issues -- in particular, the occasional sticky key. The Pixel doesn't come with a stylus either, so those who are looking to doodle might prefer the Yoga Book. There are other devices that convert your real-world scribblings to digital, such as Wacom's Bamboo Spark ($200) and the Moleskine Smart Writing Set ($200). These require internet connectivity to save your notes to the cloud, and, unlike the Yoga Book, are built for one specific purpose. 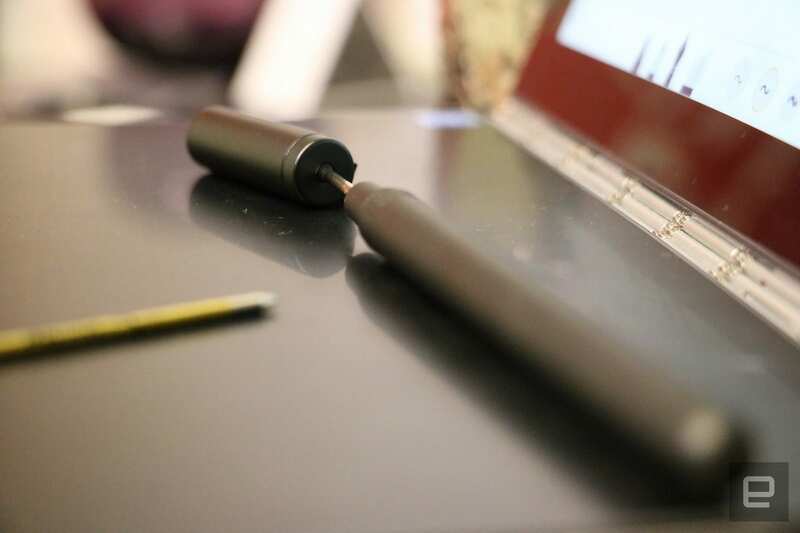 Artists could also opt for a Wacom Intuous digitizer (starting from $99) that attaches to their computers to make digital drawing easier, but this isn't as portable a solution. In the end, the Yoga Book exists in a category of its own, so none of these comparisons will be perfect. At first blush, the Yoga Book is a compelling device. The sketchpad integration feels smart and intuitive. But, as a fervent note-taker, I just couldn't see myself taking it to important meetings. I simply couldn't depend on it when I needed to quickly take copious notes -- whether it be by hand or by keyboard. This specific complaint wouldn't be as significant if not for the way Lenovo is positioning the device. It's a "tablet for ultimate productivity and creativity," according to the company's website and marketing materials. But real productivity lies in being able to very specifically and quickly control what you are entering into a device. And you can't quite do that with the Yoga Book. Its middling performance and display don't help, either. Still, it's an intriguing first step, and artists or doodlers might be interested. The Yoga Book is innovative, but innovative isn't always reason enough to buy. Maybe Lenovo will fare better with a future version, if it decides to make one, but it will have to come up with a much better keyboard and improve the tablet's performance for it to be worth considering. 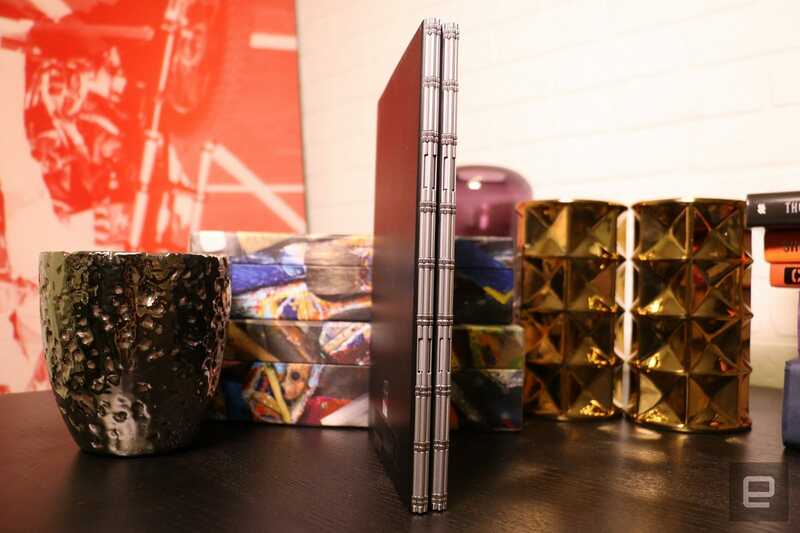 Until then, the Yoga Book is little more than a novelty item.